A pedestrian crossing the downtown courtyard of the Davies Pacific Center yesterday afternoon contributed to an arty scene. The Division of Forestry and Wildlife finished new plantings in its native Hawaiian plant garden yesterday. 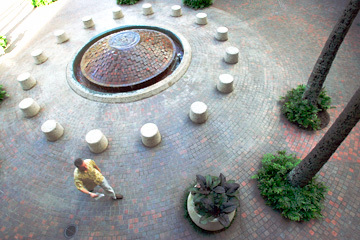 During the last two months, volunteers have been landscaping, laying mulch and weeding the garden at the state Department of Land and Natural Resources' downtown headquarters. 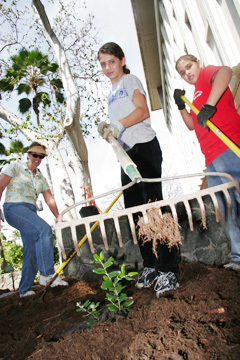 Above, Carissa Jeffery, middle, and Lehua La'o, from St. Anthony's School in Kailua, raked mulch over new plantings. 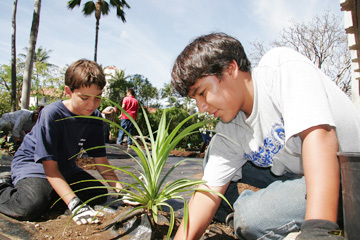 Dominic Bush, left, and Chris McGovern planted a variagated hala. 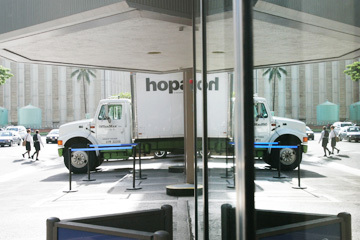 A Hopaco delivery truck seemed to back into its own reflection yesterday afternoon as two pedestrians made their way across busy Alakea Street in downtown Honolulu.